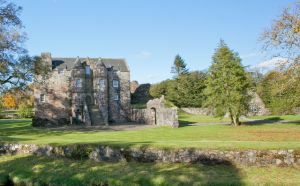 Rowallan Castle is a magnificent Renaissance mansion, home to the Muir family, based around a late 13th-century two-storey tower house. The tower house was constructed in 1263 as a rectangular keep, measuring some 35 feet x 28 feet, with a courtyard wall abutting the west side of the tower. Rowallan's chief claim to fame is that the earliest known lute music in Scotland was composed here. The tower house was extended over the following century with another storey added. The castle was extended in the late 16th century, with the addition of two drum towers. In the 17th century, the undercroft was enlarged and the first floor raised, while simultaneously lowering the basement floor. Another courtyard and gateway were added around 1661. In the early 20th century a new house was built to the north-west, and the medieval castle fell into disrepair. Excavations nearby have revealed cremation burials dating to at least the Bronze Age or even earlier, suggesting that the Rowallan site has been in use for thousands of years. Until recently the castle was only rarely open to visitors, but Historic Scotland, who cared for the site, offered pre-booked guided tours during the summer. In 2015 after a protracted legal dispute, the castle passed out of Historic Scotland's care. As far as we can determine the castle is once again closed to casual visitors. Location: North of Kilmarnock on B751 road between Fenwick and Kilmaurs. There is no parking at the Castle so you'll have to park on the verge and walk to the castle (about 10 minutes). 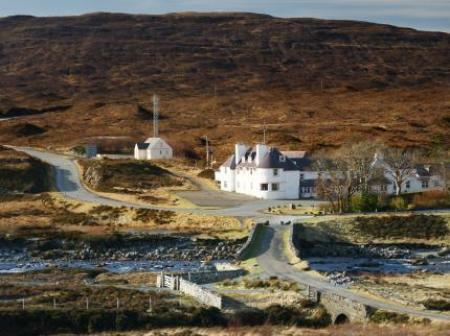 Nearby accommodation is calculated 'as the crow flies' from Rowallan Castle. 'Nearest' may involve a long drive up and down glens or, if you are near the coast, may include a ferry ride! Please check the property map to make sure the location is right for you.